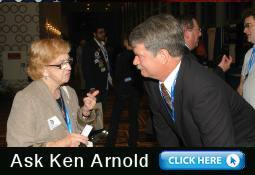 Ken is a native southern Californian and Orange County resident for over 50 years. He has two sons, Christopher, 32, and Matthew, 30, and lives in Fountain Valley with his wife, Thanh-Thanh T. Ho. He is awaiting the arrival of his first grandchild (a girl) in August of 2010. As a very successful business information systems analyst, Ken is recognized as a real problem solver, a quick learner that can see the larger picture without losing track of the details, and someone that quickly gets to the essence of the issue or problem. Over the years he has helped numerous companies, from some our county's smallest employers to Fortune 100 firms, improve their processes and profitability. Ken wants to bring his business experience and practical problem solving to Washington to improve our government, reduce waste and better oversee public resources and organizations, remove or reduce regulations where practical and, where not, to simplify compliance to reduce the burden of government on business and individuals. Blessed with high intelligence and with a mother that instilled an appreciation for the diversity of knowledge and skills of great artists and thinkers of the renaissance and of the age of enlightenment. With that and the aid of many great teachers and mentors, strong curiosity, and a life long desire to learn, Ken has become very knowledgeable in many different fields. Ken has other interests too... He is (or has been) an amateur photographer, videographer, marathoner, tri-athlete, gardener, house renovator and painter, numismatist, scuba diver, securities analyst, financial planner, yogi, nutritionist, massage therapist, bowler, chess, volleyball and billiards player, computer builder, carpenter, electrician, hiker, mountain and rock climber, aquarium and terrarium keeper, jogger, cyclist, distance swimmer, trained mediator, silk-screener, landscaper, pressman, cook, and more. Ken is not looking for another career as a politician, but to fulfill an obligation to serve this great nation and the people of this district through this time of crisis and transition. We are facing critical problems in many areas, but most urgent is to get our economy moving again. We must increase employment, restore business and consumer confidence, stabilize housing and lending markets and much more. There are no simple solutions but among the areas to be addressed for a vital future economy are: restoring American manufacturing, fixing trade and immigration policies, working toward sustainable energy independence, improving access to education, and promoting studies and research in science, technology, engineering and mathematics, building an infrastructure for the 21st century especially in energy and communications. If given the opportunity to represent this great district, he promises to truly do that. He promises to have well staffed district offices and to listen to his constituents, and to try to help whenever appropriate. Against political advice, he intends to make all his votes and public actions very available online and to explain them as needed. He truly wants to serve the voters and others in the district and not the special interests. To be able to address many of these issues, we must get our economy going again and "getting America Working Again", is a major theme of my campaign and reason for my running at this time. The phrase refers both to quality jobs in a sustainable economy, and to getting our various levels of government working again for the American people rather than the moneyed interests. Ken has always defined himself as predominately liberal, but with a large dose of realistic pragmatism, some fiscal conservatism and a bit of social libertarianism. He was raised and educated by a diverse assemblage of free thinkers; and exposed to a wide variety of political and economic thinking, reading from publications ranging from the National Review to Ramparts. Ken (like many of you), has seen the failure of extreme ideologies and policies from across the political spectra. Fortunately, Ken possesses a rational and practical appreciation for what functions can and should be provided by government and what may or should left up to markets and individuals. He has a strong desire for minimal government and taxes, minimal interference in individual liberties and for the minimizing regulatory burdens upon business. However, he would not allow any of those desires and goals to interfere with assuring that the government legally, effectively and efficiently provides those services which the people rightfully expect of it and those they depend upon it providing for the common good and for our collective welfare, safety and security. I want the news business to again become responsible and responsive to the needs of people and society not solely to sponsors, owners and the bottom line. I am not an extremist or ideologue but believe in reasonable rational solutions. I don’t believe government is the source of all our problems and I don’t believe it is the solution to most of them. You can call me a liberal if you mean someone that is open to looking a things in different ways and considering new and creative solutions when old ones no longer work, someone who believes in the possibility in progress and reform and is not unduly tied to tradition. You can call me a progressive if you mean someone that thinks that as the world changes, we sometimes need to progress forward onto new ideas and better ways of doing things, someone that believes in human and societal progress and that we can build a better world and improve our lives. But you should consider me a moderate if to you that means someone that trys to avoid extremes, that looks for the middle path or moderate and proven solutions, someone that looks to balance the many forces, powers and influences upon the government and society so that none is too powerful or dominant. You can call me a conservative if you mean someone that loves, wants to protect and will conserve our Constitution and the principals and ideals it contains and those upon which our nation was founded.